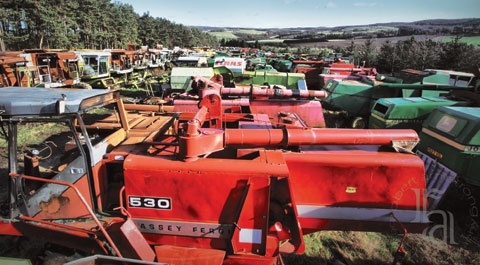 An aerial shot of John Manners and son, 350 combines awaiting breaking!! 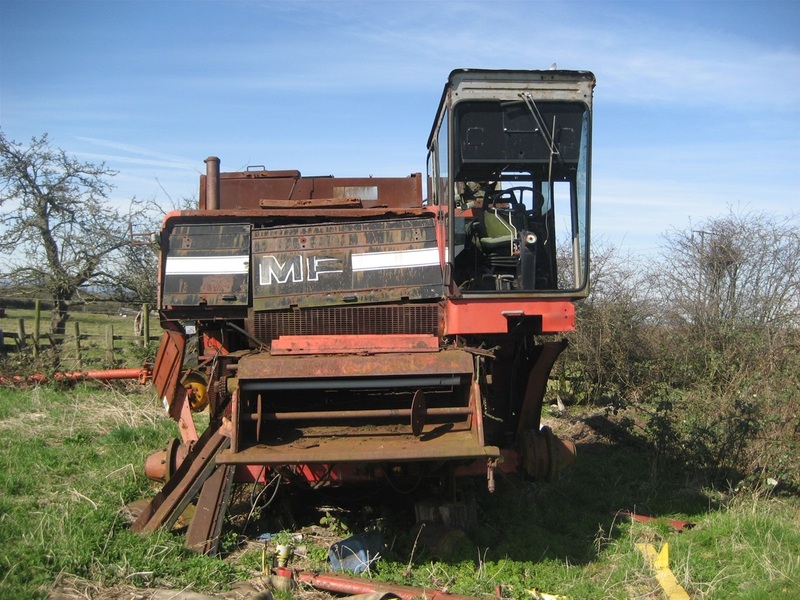 Without doubt as owners of vintage Massey Combines the use of Combine Breakers like Dave Pantry in Doncaster and John Manners and Sons in Northumberland, without there services running this old machinery would be near on impossible, they both offer an exceptional service with second-hand parts stripped and normally delivered overnight! Which is a service you need especially at harvest time and with a somewhat weather led timetable of working. 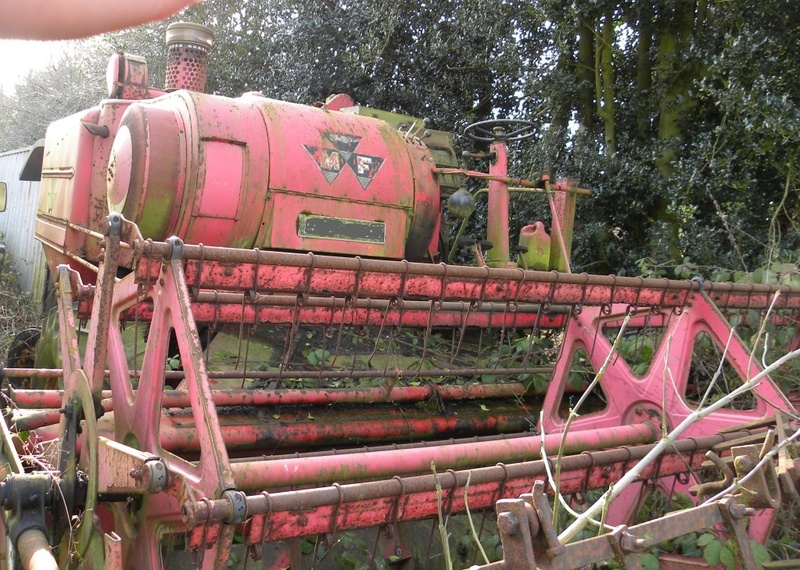 Running older machinery obviously comes with no guarantees but allows input cost conscious, medium to small growers, the chance to budget their farming business in these days of very poor returns. Wrecks and Relics Fire !! This can only be an unhappy ending !!? 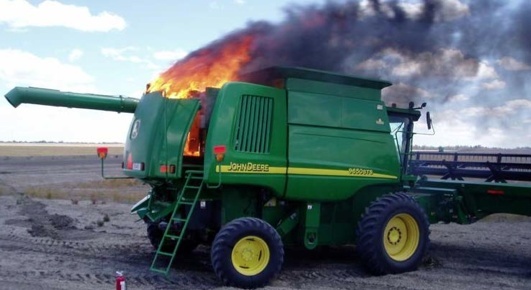 Probably the biggest killer of Combine harvesters is Fire ! 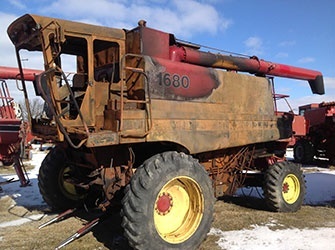 About a Thousand combines a season go up in flames, this threat hasn't changed from the very early models despite the lack of multiple belt and pulley aarrangements on modern combines, plus the addition of compressed air systems blowing chaff and dust away from components on certain models on a regular basis during harvesting operation. 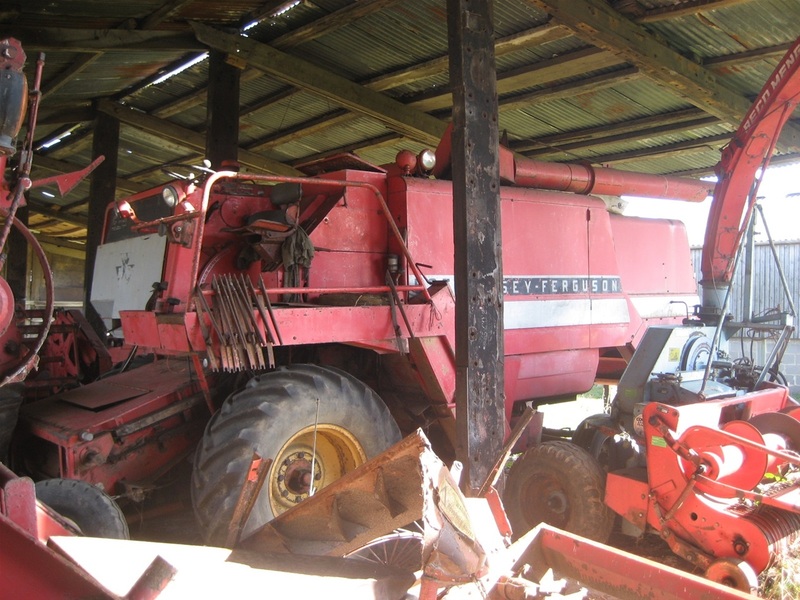 The humble combine has all the ingredients for catching fire hot bearings, friction off rubber belts, hot exhaust manifolds, plus normally working in very hot temperatures in summertime. Fires can start practically anywhere! on the machine, but most obvious places are in and around the engine bay, the early Masseys eg the 780s had the engine mounted underneath the combine elevator if you didn't pay particular attention to regularly cleaning off around this area during the day you would pay a heavy price for sure risking fire, and remember the early models were powered by gasoline and petrol Tvo engines, a very dangerous excellerant. 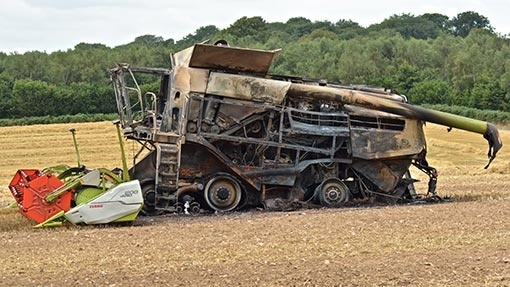 Nearly every farmer who has grown cereals for a considerable time has experienced a combine fire, very few fires are not terminal to the machines survival! Remember you are mostly loaded up with fuel to capacity every day and also there would be many litres of hydraulic oil on board as well, add the copious amount of fine dust that accumulates in every nook and cranny of the machine, then you have a disaster waiting to happen. I well remember a Massey 525 fire local to here about 40 years ago, the operator had been cutting for about two hours, he saw smoke rising from the vents in the engine bay cover, he stopped forward motion of combine lifted up the large engine bay cover and the flames shot up at him with the entering air feeding oxygen to the flames!! The driver who I knew very well grabbed his toolbox and lunch bag, by the time he walked 100 metres to the main road the combine was totally engulfed, a passing motorist drove to a phone box and rang the fire brigade but the 15 acre crop was well alight and lost also, the operator told me when the flames shot up at him ,his reaction was I've got a full flask of tea I could sacrifice on the flames!! Or I could get off quick and drink the tea while awaiting the Fire Brigade !! He chose the latter!! God bless you Ted!. When you factor in the loss of the crop also its a total disaster. Most responsible operators will carry a current extinguisher or 2! On the machine as we do but they would be totally inadequate in most cases,unless you were fortunate to catch it early! and you have to assess whether your personal safety is worth more than your combine! ?which can be replaced! But probably not easy in our case?! 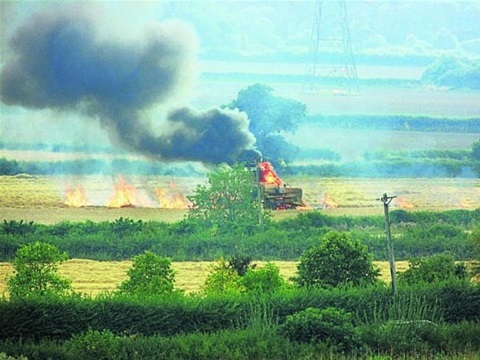 Some larger arable operators will keep a spare tractor and cultivator on hand close when harvesting to cultivate around a stricken combine in the event of fire and stop the fire spreading through the crop! A tried and trusted method of fire control used for many years. The biggest problem today with the modern machines is that the operator is cacooned in an environment remote from the machine in a climate controlled cab,he would not smell a hot bearing or shredded belt, or smell burning or unusual hot smells! Some operators have carried on operating when their machine was burning spreading fire behind them, without any knowledge! Sometimes warning alarms will sound but usually at this time it's to late just enough time to abandon ship!. 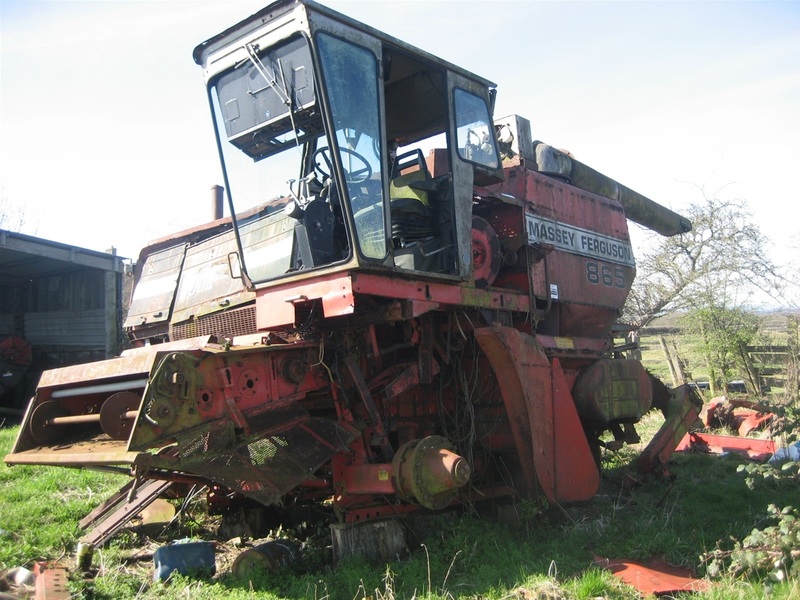 With combines now costing up to £350 thousand ! 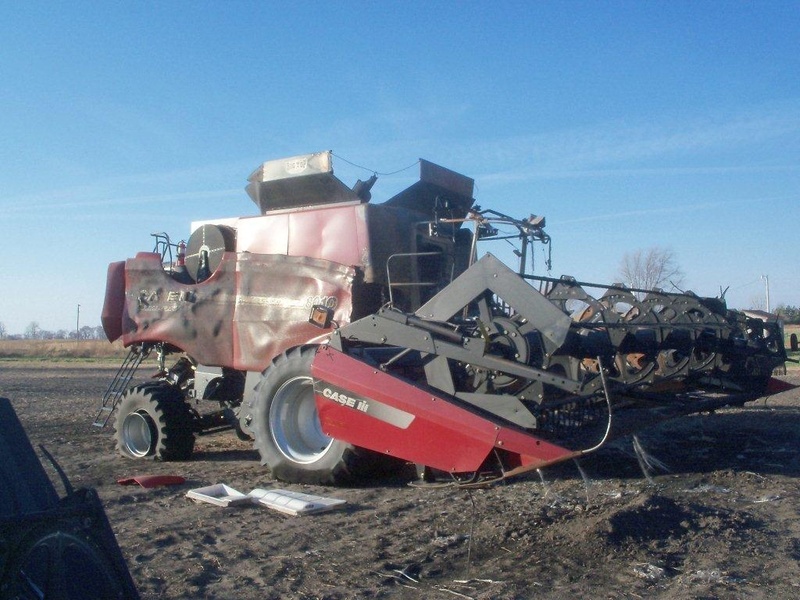 It's a very expensive fire indeed, and with the machine out of action and time spent hiring or locating a replacement especially at harvest time it's a scenario you wish not to happen. Well it doesn't really matter how old a combine you run today there is a lot you can do to limit the chances and is to regularly maintain the combine during and after use checking over the areas that produce the heat the engine bay and exhaust manifolds around the rotating shafts and belts and pulleys checking for bearing wear and blown seals making sure bearings are greased also looking out for any chaffing on the wiring what is considerable on newer machines, basically if you have an industrial compressor that you can tow around this will enable you to keep the machine relatively clean from the constant build up of the dangerous dust.Sadly combine care seems very overlooked today these expensive machines are normally stored back into their winter storage without even the basic clean down, which causes other issues like rodent damage mice and rats scavaging for food in what is effectively a larder full of food!! This is another problem that can lead to fires as they chew through wiring and plastic pipes which are used for various purposes today, also this damage will cause a total headache for a engineer trying to locate alarm system faults on the combine monitors due to wiring damage, time consuming and very costly!! Blowing out a combine with compressed air is a very messy job but very effective, and with the right equipment gloves goggles,ear protectors,and a good pair of coveralls on it can be achieved in very little time. All of this seems common sense but unfortunately at harvest time the urgency to keep going and neglect the vital maintenance that's expected is quite commonplace. I don't think it's possible to prevent every combine fire but some of the 3/4 year old machines I have seen with large accumulations of dirt and harvest dust on board I think it's a trend looking to continue for sure. If a combine operator turns up to drive your combine with a white t shirt pair of shorts and trainers and a smartphone logged into Facebook ready for a busy day! I guess you should worry !!? But perhaps that is the way today!! But for sure the trend today regarding combine operators has changed! 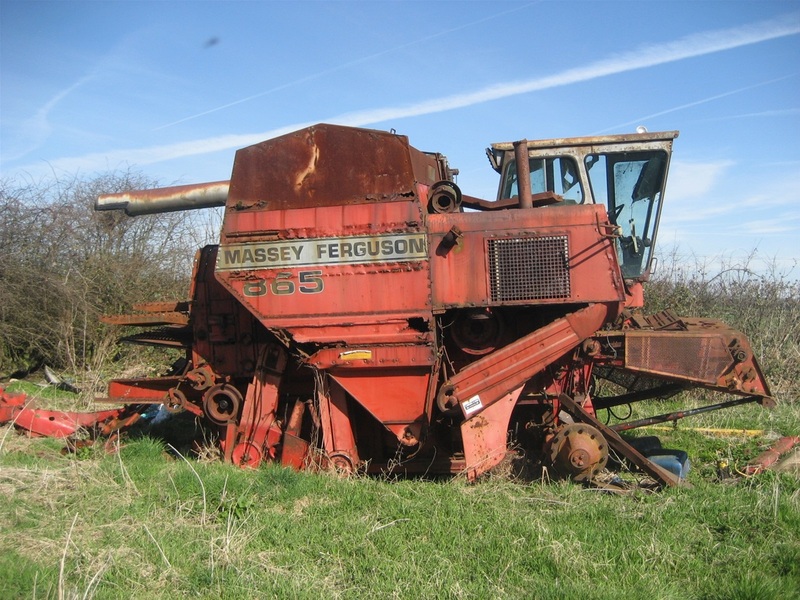 The larger estates and arable specific businesses tend to put their more experienced operators on establishing the next crop growing campaign as the complexity of the machinery used to drill and cultivate requires a higher degree of skill than the combine to operate. Foreign exchange and second year agricultural students are used extensively for these positions. 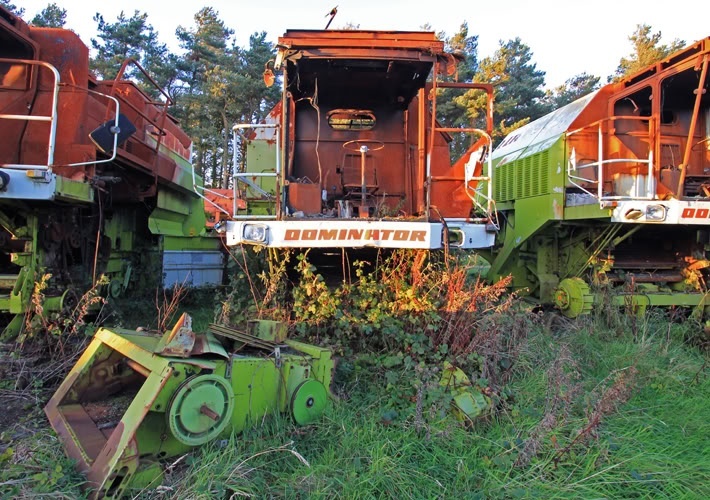 From about May onwards recruiting for combine drivers will start with positions all over the Uk,the job will require bursts of very long hours in between our somewhat challenging summer's, and will require patience and a very positive attitude when things go wrong! Which they do! But it is a very rewarding job to gather in a crop that has battled all what mother nature has thrown at it and you have successfully brought it home!! 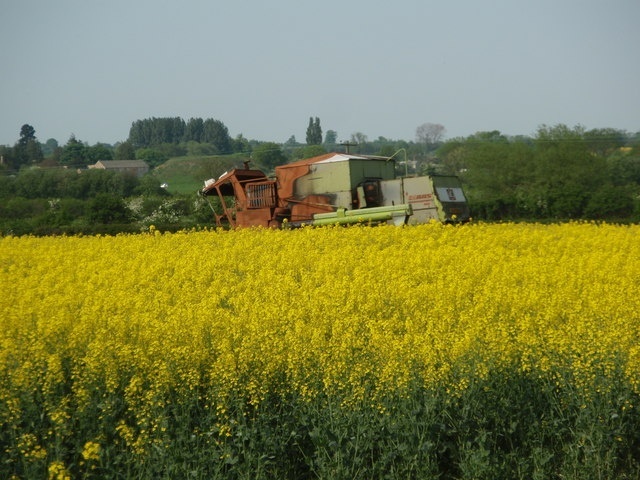 Just remember with the summer months approaching, if you are stuck behind one of these giants of the harvest fields! Moving to its next field, just Remember 6 out of 10 products you buy in your supermarket probably passed through one of these machines!! !And he will be in more of a hurry than you are !? Have a safe 2015 harvest everyone!! 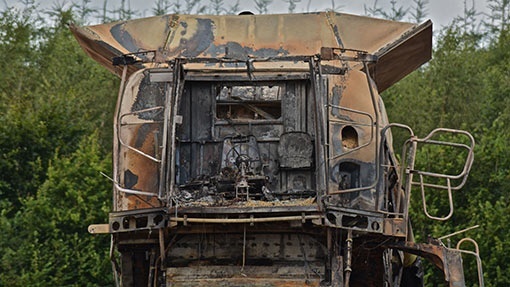 Combine fire photos to follow!!! This Class terra trac burnt out!! Table looks ok? And the field!! Totally destroyed! This once proud giant of the harvest fields!! 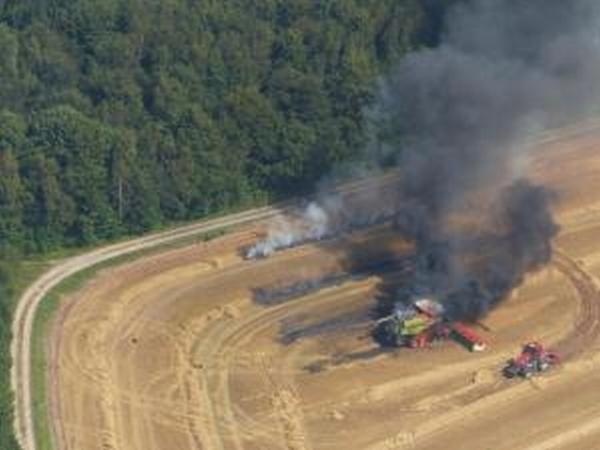 This Aerial shot shows a stricken combine being cultivated around to prevent fire on the ground spreading further. 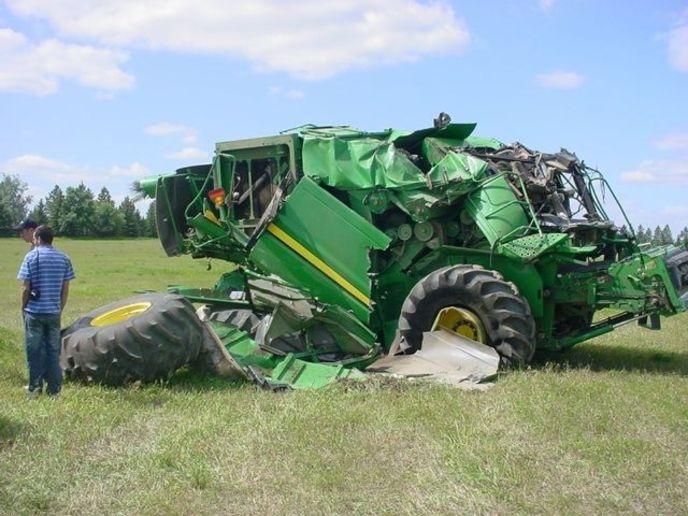 This John Deere is well away, luckily it has been driven onto some bare land !! 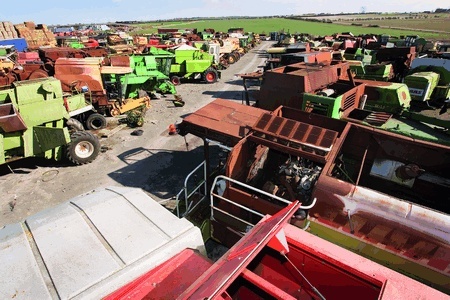 Some fire damaged Masseys lying in John Manners yard awaiting dismantling!! All over for this Case, and the surrounding area has suffered a scorching!! 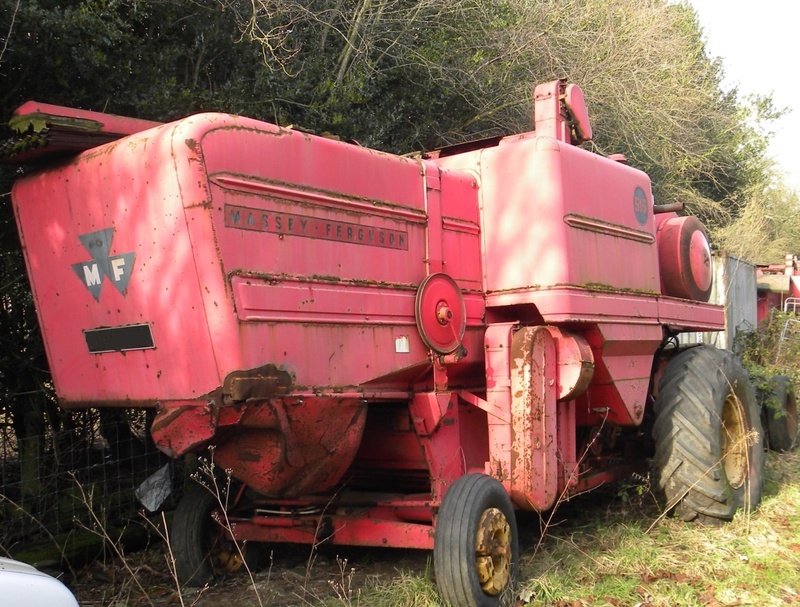 A selection of fire damaged machines at Burden Bros in Kent a well known combine breakers!. This popular Case International rotary,Awaits the breaker! This elderly fire damaged class can only sit and watch the next season's crop ripening! This old girls harvesting days are sadly done!! A brace of cab fire Dominators await there gradual destruction!! This forlorn looking 865 belongs to Chris Hodgson, it. was bought many years ago just for spares! 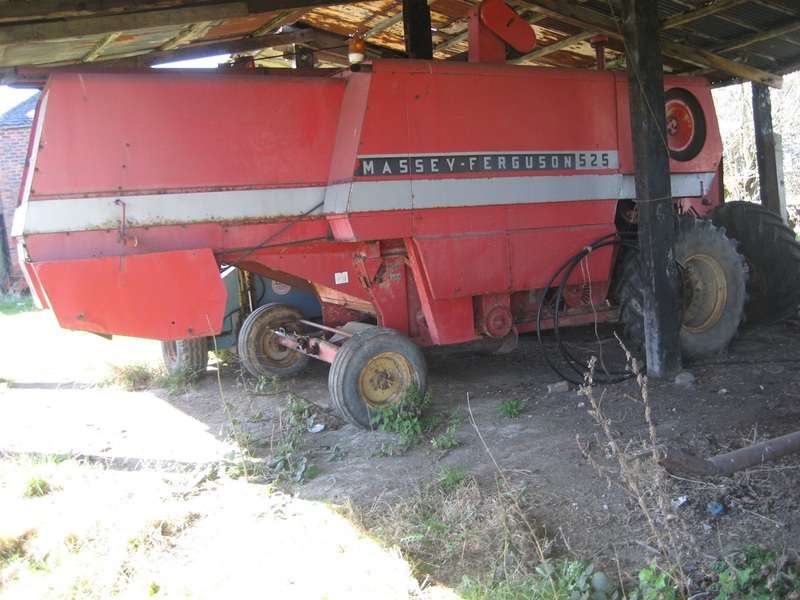 The original owner kept the combine in an open type barn one field away from the North Sea!! Which rusted out the machine in a very few short years!! No fire damage here just the worst that mother nature can manage!! Pretty well stripped out of spares now! Her work done. Certainly not a wreck! 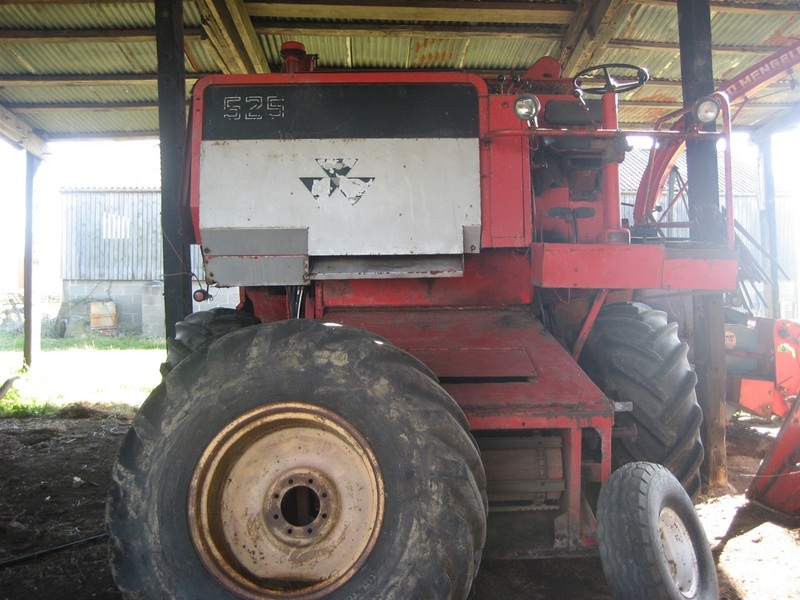 But a retired 525 again owned by Chris and Phill Hodgson This 525 came New to the farm in 1974and has remained there, obviously with 4 865s now to use the 525 stays in the shed enjoying her retirement!! Looking very tidy for her 39 years! A once frontline machine cutting up to 400 acres a season. This forlorn looking old girl was for sale several years ago, it had obviously stood outside for some time, and most probably ended up cut up and gave the owner enough money to buy a plasma television!!? Tin work looks quite reasonable, with no major battle damage!! Although no surprise the multi flow is long gone!. Sorry!! I'm just speechless at this one!!? Hit by an Alien spacecraft ?perhaps?? Imagine ringing the boss !! ?